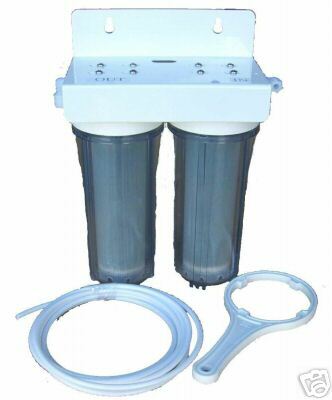 The purpose of the DI unit is to further reduce the mineral content of water after RO system. If you want to achieve very pure water, very low or 0 TDS reading for large amount of water, then this is the unit to get. NOTE: This DI unit is used in conjunction with an RO system or RO+DI system. 2 lbs of DI resin. It will treat about 3000-4000 gallons of RO water, but actual capacity depends on tap water TDS and RO water TDS. Two 10 inch cartridge type DI filters with color changing Nuclear-grade DI resin. Clear Filter Housing to observe color changing DI resin: when the color changes from green or light brown (when new) to dark brown and black (when exhausted), it is time to replace the resins. Vertical placement: DI filters stands upright can reduce the effects of channeling. It is more efficient, and removes more minerals.